High Tuition Fees or Lower Ranking - How to decide your school? You have your acceptances in hand, and now you’re trying to make a decision. Where are you going to spend the next few years of your life? This decision will impact the people you meet, the things you study, and the career you embark on once you graduate. 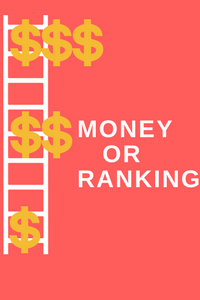 One of the most difficult aspects of this decision is choosing between money and ranking. You may have received an acceptance to your top-ranked dream school, but no funding; and you may have gotten a full-ride, but from your safety school. Now you’re between a rock and a hard place�"how are you supposed to choose? For the most part, where you decide to go to college won’t affect your long-term job prospects. In his thought-provoking book, Where You Go Is Not Who You’ll Be the New York Times columnist Frank Bruni argues that elite colleges do not have a monopoly on success�"who you are, rather than your college’s ranking, makes a much greater difference in the trajectory of your life. This assertation is backed up by scientific data. In 1999, the economists Stacy Berg Dale and Alan Krueger published a study which examined the employment outcomes of students with similar academic profiles�"some of these students ended up at elite institutions and others at slightly less selective schools. They found that the students who attended less selective colleges earned the same amount as those who ended up at elite universities. A follow-up study, published in 2011, came to the same conclusion; who you are matters much more than where you go. Basically, if you’re smart enough to get into an elite school, you’re smart enough to be a success anywhere. However, this doesn’t mean that your university choice doesn’t matter at all. Dale and Kruger found that those students who picked schools with higher sticker prices ended up with higher earnings. This probably has to do with the university's resources-the more resources they have, the better off its students are in the long run. When you’re looking at colleges, be sure to check out the university's endowment and how much money it spends on each student. Furthermore, students from more disadvantaged backgrounds are more likely to thrive at elite institutions; these students earnings were higher when they went to the best schools. This might have something to do with graduation rates. Writing in the Chronical of Higher Education, Jeff Selingo argues that “the so-called ‘peer effects’ of being around other students who want to finish college make[s] a significant difference.” Schools with higher graduation rates have cultures that encourage graduating and are likely to have more resources for students struggling academically or financially. If you decide to attend a less selective institution, make sure that the school’s four-year graduation rate is still high. Rather than a degree from any specific institution, most employers are searching for people who have the skills and leadership abilities to succeed in today’s economy. A 2014 Gallup poll found that 84% of US business leaders believe that the amount of knowledge a candidate has in his or her field is very important, while only 9% believe where the candidate received his or her college degree is very important. For undergraduates, rankings matter only in the broad sense. The difference between a college in the top 30 and a college ranked in the middle of the pack is minimal. If you put in the work while you’re in college, no matter where it is, you’re on the track to success. For graduate students, the school’s ranking can matter much more. For example, law school rankings are incredibly important for employment outcomes. Ben Taylor, a Forbes columnist, writes that “…rankings couldn’t be more important [for law school].” Within law school, the T14, or the top 14 schools in the country, are the crème de la crème of the law world, and their graduates are promised high salaries at the best firms and vaunted clerkships. If you choose a lower ranked law school, that doesn’t mean you’ll never find success. But, you might not get the sky-high salary the law profession is famous for. While graduates of the top-tier can expect about $160,000 if they enter the private sector, the median salary for new lawyers is only $69,000. According to US News & World Report, which ranks law schools, “only 35 of the 197 ranked law schools reported median private sector salaries exceeding $100,000.” Given that the average law school graduate borrowed about $113,000 to pay for their legal education, anything below six digits will make loan repayment difficult. The market and economy are always changing, and business schools need to change with them. As a result, the rankings change all the time and matter less. For medical school, the rankings do matter some, and the top medical schools are entrenched at the top of the rankings list. However, aspiring medical school students should consider the type of medicine they want to practice, as well as where they want to practice it. If you’re interested in oncology, a ranking that only looks at primary care doesn’t matter much. If you want to live and work in Denver after you graduate, you shouldn’t go to a school with no connections to Colorado no matter how high they are on the ranking list. In the end, you are going to have to make the choice that’s right for your specific personal and financial situation. If you or your parents have saved a lot of money for your education, maybe you can afford to go to your dream school without any aid. If you’re like most people and will need outside aid to pay for your education, you should probably follow the money. Rather than looking for any specific ranking, as an undergraduate, you should search out the school that fits you best. Visit campus, get to know the students and professors, and think about whether you can envision yourself spending the four most formative years of your life there.